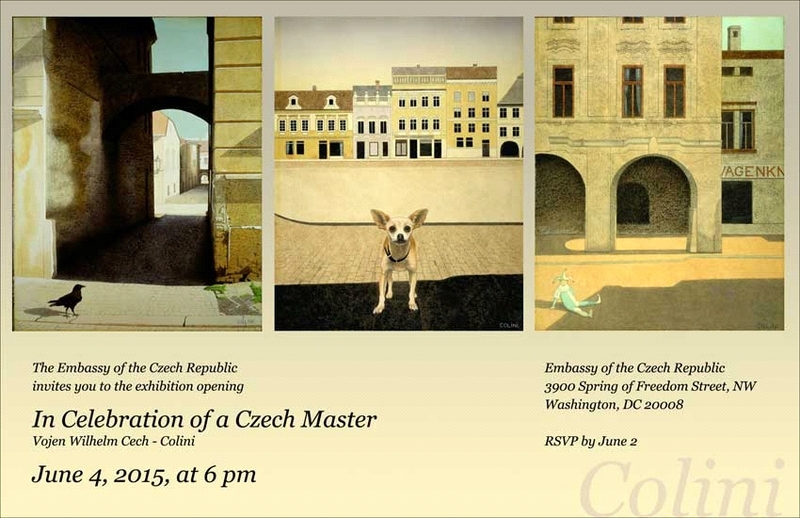 Exhibition of Colini's Art Opens at Czech Embassy in D.C.! INVITATION TO ON-GOING EXHIBITION: The Embassy of the Czech Republic invites you to the exhibition: In Celebration of a Czech Master, featuring the work of Vojen Wilhelm Cech, better known as Colini, as it continues at the Embassy in the weeks following the opening starting Friday June 5th. Vojen Wilhelm Cech - Colini (1927-2010) was drawn to the unique and imaginative qualities of surrealists. As a young man, Colini made monthly visits to Prague and dreamed of becoming a master painter. 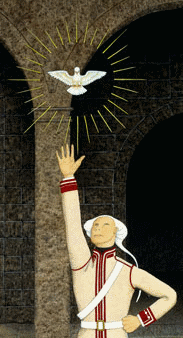 He became fascinated with Italian art of the Renaissance period and made his decision to paint only in egg tempera. He began to find ways to expand on the ideas of surrealists by incorporating techniques, iconic places, and characters of the Renaissance into his modern works. Inspired by Renaissance artists who adopted the names of their home towns, Colini chose to follow this tradition. 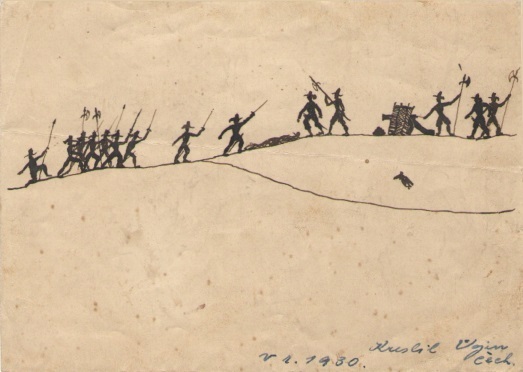 A native of Kolin, he signed his paintings as "Colini," the name by which he eventually became internationally known. "His images are from another time, another place. His is a magical world, its landscape strange, haunting and always enigmatic." — Malcolm Preston, art critic, Newsday. See full review by Mr. Preston. Can't make it to Washington? View a virtual display of the art in this exhibition by clicking here. Missing the old Virtual Exhibition page? You can reach it by clicking [and bookmarking?] this link. Colini, born in 1924 in Kolin, Bohemia, first studied art with professor Kutil, then an exponent of German Expressionism. In 1943, Colini moved to Prague, where he was exposed to the work of the leading Czech surrealist, Karel Maly, a disciple of de Chirico. Leaving Prague in 1947, Colini began a 12 year journey of self discovery, living in Switzerland, France, West Indies, South America, and Canada. In 1959 this sojourn came to an end in New York, where he took up his greatest challenge, that of distilling his rich and haunting life experiences into graphic images. Since then however, he is returning frequently to Germany and Italy where he feels equally "at home." In 1972 Colini was invited to join the Gallery Schreiner in Basel -- which in those times was affiliated to the famous Gallery Peithner-Lichtenfels from Wien -- and thus was the focus of Ars Fantastica movement in Switzerland. Since his acceptance into this group, Colini's work has travelled to the major cities of Switzerland, West Germany and France. Finally in the year 1975 Colini was accepted as a member in the prestigious "Kunstlergilde e.V" in West Germany. This important success opened the doors to the German art scene and Colini began to exhibit in the Gallery Koelner Kunst Kabinett, Gallery Scholler, and Gallery Blankenborgh. His work was accepted in the prominent "Inter Art Galerie - Cologne" and he joined "Phainesthai" a group of Koeln artists. He took active part in the evolution of the organization into the "Gruppe 82 Koeln". At the end, when one comes through the full circle, one should arrive where one started. That is why I am so grateful for the chance to have the retrospective exhibition of my works in this august location, because it gives me the opportunity to finish my career where it began, on the shores of our river, within the sight of our cathedral. This is a rare privilege. At this point, we should pause perhaps for a while and remember the faces of the comrades who started with us on the road many years ago, but who finished much too early or ended on distant shores... I was going to say how nice it would be if they would be here now, with us -- implying they are not here with us -- however, I wonder, can anybody really leave Kolin? This video contains excerpts from a documentary tribute to the life of Colini, currently in progress. Used by permission. 1930. Click on the graphic to view a larger version. This page, all images, and all other content of this website, are Copyright � 1972-2015 by Vojen Wilhelm Cech and Margaret Cech, Scranton, Pennsylvania, USA.